The Vibrant Syracuse Spaces Green Roof project is located at 200-206 Geddes Street, west of downtown Syracuse. A green roof was installed on the five story building which has a roof surface that covers approximately 12,831 square feet of total area. 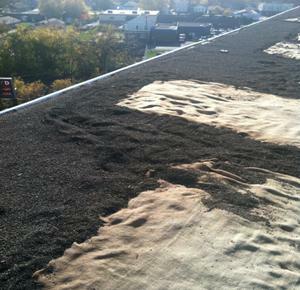 The green roof manages stormwater on the rooftop and provides extra savings in energy cost for the facility. 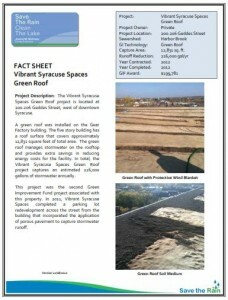 In total, the Vibrant Syracuse Spaces Green Roof project captures an estimated 226,000 gallons of stormwater annually. This project was the second Green Improvement Fund project associated with this property. In 2011, Vibrant Syracuse Spaces completed a parking lot redevelopment across the street from the building that incorporated the application of porous pavement to capture stormwater runoff.